Billy Ridgeway’s not in the greatest shape at the moment by any stretch of the imagination. An aspiring author, he spends most of his time either making artisanal sandwiches for the better-off-than-he-is who frequent the shop he works at, or trying desperately to get his writing published. On the eve of his first launch party, after finally getting a story in at a small literary magazine, Billy wakes up to find a strange person in his apartment: the honest-to-badness Devil. The Lucifer Morningstar of legend turns out to be kind of cool though, having brought with him some fantastic coffee, and after a brief PowerPoint presentation he asks Billy a simple question: what would you do to become a famous author? 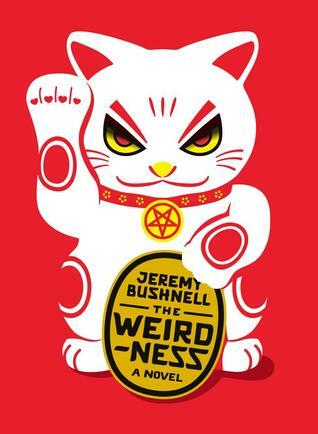 So begins The Weirdness, the appropriately weird first novel from Jeremy Bushnell. The story read to me as a combination of the metaphysical world posited by Richard Kadrey (Sandman Slim) and Toby Barlow (Sharp Teeth, Babayaga) mixed with the mumblecore-hipster sensibility of Lena Dunham’s Tiny Furniture. The characters are for the most part very self-centred aspiring artists, with Billy’s girlfriend Denver being a notable exception as she’s already been recognized as a talented filmmaker. I reckon I would have got a bit more enjoyment out of this facet of the book had I more experience of the Brooklyn literary scene, but the determination and hustle showed by some of the characters in the story were pretty recognizable from people I know in the book world. I don’t know what it is about New York City novels that kind of turns me off, perhaps it’s the need to have everyone be a neurotic stress case all the time? I never get tired of this sort of thing in Hollywood stories, though, so I really have no idea. I also appreciated the exaggerated influence of blogs and the bad buzz they can generate in this aspect of the story. It begins with Billy’s writing being panned by Anton Cirrus, editor of “Bladed Hyacinth”, even before his debut reading even goes off, and then descends from there. The pettiness and posturing of some aspects of the “literary” blogosphere read incredibly true to me, especially with the overly verbose and preening voice used in the first post. The titular “weirdness” worked a bit less for me overall. I appreciated the shaggy dog aspect of the story, with things starting off relatively strange (having Satan show up in Billy’s house, a literary magazine with sinister motives) and getting even weirder from there. I felt by the end though, once superpowers have developed and magic incantations start flying all over the place, that the seriousness required by the premise had been lost. The characters, perhaps reflecting the mumblecore-tinged world in which they live, are just so damn blase about everything, it started to drive me a little nuts. There’s not much in the way of anyone having to reconcile their psyches with the amazingly over-the-top events of the story, they all just take it in stride, even though they’ve changed physically in many ways by the end. The book also does that kind of strange thing where at the beginning of the chapter a few key phrases are highlighted before the prose starts again, which is something that you’d see more often in a story from a hundred years ago, or at least in Cormac McCarthy’s Blood Meridian. I often wonder what the point of this stylistic technique is in a modern-day story, but I do admit I kept a finger at the front of the chapter to flip back and see what the connections were. Overall, if the idea of a book that posits getting ahead in the overly dramatic and cutthroat NYC lit scene against the literal end of the world sounds like fun, this bit of Weirdness might be up your alley. This is one of those books which wormed its way into my TBR stack solely because of the cover and title, and even after reading your thoughts, I’m not sure if there is actually a match to be made between the book and me (it seems like the kind of book that might be enjoyed most in a very particular reading mood). But I am still keen to try. It’s a pretty quick read, but on the whole I feel it is very skippable. I wish it had gone to more extremes, and that the characters actually gave a damn about everything that happened in the story.